There are a thousand scenes like this along the Highline Trail of the High Uintas Wilderness, so many as to make this one almost unremarkable, except you should know this particular one is Jean Lake. I have spent time on various locations along the Highline Trail through the years, and if you love wilderness, hiking, and fishing in the splendor of unparalleled high mountain outdoor environment, this is the place. Get away from the WalMart crowds, head for the clean air and clear waters. You'll not regret a minute of it. 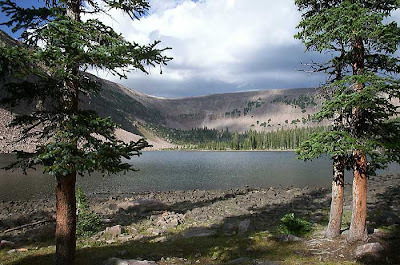 My favorite ingress for the High Uinta Wilderness is through the Grandaddy Lakes Basin. It is the deepest penetration and the highest trailhead on the south side of the mountains. Access to all kinds of opportunities from there, including unlimited beauty and the freedom of the hills. I've often wondered how growing up almost next-door to the Uintas in Kamas shaped our grandmother into the woman she became. These western mountains have a stark lushness (I know that's a bit of an oxymoron) that reaches into my heart, and I know grandma spoke of missing the mountains. Here in East Texas, on the edge of a giant city, we are surrounded by southern forests that have their own beauty, but I miss these places your are taking us to. I don't know if your tour is making it worse or better for me. Either way, thank you. I'll probably never hike the Highline Trail again. I'm kinda saying farewell, too , in a way. The mountains and the deserts have been very good to me, when solitude and lonliness was what my heart craved most. Away from the rat-race, closer to Heaven, in sight of so many splendors of the Lord's unspoiled creation. I often thought to myself, why ever return?